UPDATE: Ulsterbus will provide a cross-border service from Muff to Derry from Wednesday next, 23 April. It brings to three the number of routes that will have a replacement operator following the winding up of the Lough Swilly Bus Company. McGonagle’s of Buncrana will step into the breach and take over the Buncrana-Derry bus route from Easter Sunday, while Bus Éireann will operate on the Letterkenny-Derry route. 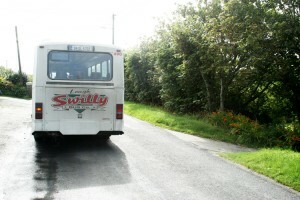 This is a temporary arrangement following the wind-up of the Lough Swilly Bus Company. The new operators were confirmed on Thursday in a statement from the National Transport Authority which licensed them in conjunction with the North’s Department of the Environment. McGonagle’s Bus and Coach Hire Buncrana will operate the Buncrana to Derry service via Fahan, Burnfoot, Bridgend and Coshquin from Sunday 20 April. Bus Éireann will provide the Letterkenny to Derry service via Manor, Newtown and Killea from Tuesday 22 April as part of its routes 64 and 480. There is, as yet, no information on replacement services for the other Lough Swilly Bus Company routes, or the school runs the company provided. Fine Gael TD Joe McHugh said: “It’s very regrettable that Lough Swilly Bus company has ceased trading. “I hope that the workers are looked after with regard to their redundancy package and entitlements. “I’m confident that the contingency plan for school transport will be in place after Easter.